The humble USB drive—supplanted by the download and the cloud sync, but still useful in all kinds of ways. If you’ve got an old drive lying around, here are some of the ways you can put it to use that don’t just involve sharing old pics to your mom. Many different Linux distros will happily run from a USB drive, which means you’re effectively operating a whole computer system packed on to a portable disk—you can take the stick with you wherever you go, along with your saved files and installed apps, and plug it into any computer with a spare USB port to pick up again where you left off. We’ve written a full guide on how to do this—with the Raspberry Pi Pixel OS as our example Linux distro—so check that out for further information. Instructions for many of the other distros, including Ubuntu and Kali, are freely available on the web, and you don’t have to be a technical expert to get the OS images downloaded and written to USB. If running a whole new OS sounds a bit too daunting, you can stay in Windows but keep the bulk of your apps on a USB drive—this means they stay out of the way of your main operating system and won’t clutter up the main hard drive unnecessarily. Most popular apps can be run in this way, and we’ve previously written a full guide to how to set it up. The benefits are the same as running Linux from a USB stick: The ability to take your files and apps everywhere you go. 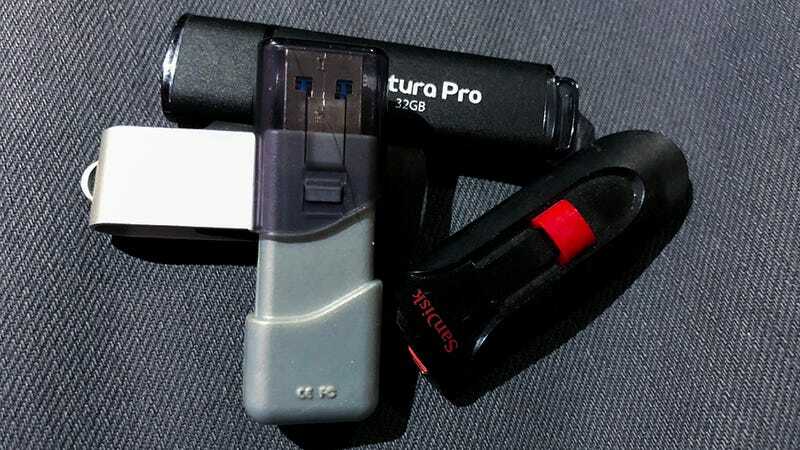 As long as you know you’ve got a PC with a spare USB port at your destination, it’s a lot easier to throw a USB stick in your bag than a full laptop. To get started and to see the range of applications on offer, head to the PortableApps.com portal. We’ve talked about how cloud services are now more often used to store files than USB thumb drives, but there’s one time that having the physical files can be more useful—on vacation. Keep your key documents with you at all times and you don’t have to be hunting around for a Wi-Fi connection or waiting for a slow and expensive cellular link to work. Okay, you’re still going to have to find a computer with a USB drive at your hotel or a local internet cafe, but it’s certainly easier than lugging around a laptop, and you don’t have the hassle and security issues of trying to type in your cloud account passwords on a foreign computer. Even if it’s just a backup with an itinerary on, it’s worth putting together. Should your computer (or one you’ve been called on to fix) get hit by a virus, cleaning up the mess isn’t always straightforward—the more advanced malware programs out there can take steps to make sure they’re difficult to find and resistant to the most common removal techniques. Some might stop you getting online or even getting into your PC. That’s where a USB stick clean up kit comes in: Get one or more on-demand scanners on the drive, and you’ve got a portable virus removal tool you can take anywhere. The likes of Anvi Rescue Disk, ClamWin Portable, Avira PC Cleaner, and Emsisoft Emergency Kit are all free to use and will run happily from a USB drive plugged into the infected machine. Few tech problems can make your stomach sink like a computer that won’t boot up, but a USB recovery drive can help get a Windows machine back on its feet again. You do need to get the recovery drive set up in advance for this to work. To do it search for “create a recovery drive” from the taskbar then pick the top option when it appears. Select Back up system files to the recovery drive, then Next. After plugging in a USB drive, choose it from the list, and pick Next then Create. When the process is complete, you’ll have a drive you can boot from in any future emergencies. Windows features a technology called ReadyBoost, where a USB drive can be used as a disk cache to speed up read and write times. It’s not quite as effective or as widely deployed on more modern systems, but it’s still worth a try, and can make a significant difference to performance if you’re dealing with an older Windows laptop or desktop. To get started with ReadyBoost, pop your USB drive into a Windows computer, then open up File Explorer, right-click on the drive, and choose Properties. Open the ReadyBoost tab and follow the instructions on screen to prepare the drive—the dialog box should tell you if the drive and your system are suitable for ReadyBoost, and if you’ll see any benefit. You need a certain kind of USB stick for this particular trick, rather than just any USB drive you have lying around the house, but it’s still a cool use of the technology to be aware of. First up you want to buy a special USB stick that’s compatible with the FIDO Universal 2nd Factor (U2F) standard (you’ll find a bunch of them on Amazon for not much money). And why would you buy one? Well, after following a simple setup procedure, you can use your new USB drive to securely log into accounts including Google, Dropbox, Dashlane, and others—the memory stick acts as a two-factor authentication layer, proving you are who you say you are when you sign in, in addition to your username and password. Here’s another occasion when packing files onto a USB drive rather than linking to them in the cloud can be effective: When applying for jobs. You can include your CV, some examples of your work, and maybe a video presentation too, and pack everything up smartly and send it to prospective employers as one way of standing out from the crowd. Even if you’re happily employed, USB sticks can make for effective networking tools. If you buy up enough cheap USB drives, and load them up with your contact details and portfolio, then you can give them out at events like business cards. You can even buy business cards that come with a tiny USB stick built in, if you think they’ll be useful and the receivers trust you enough to not assume you’re trying to infect their computers. We’ve already spoken about running apps or even a whole OS from a USB stick, but there’s another related use for a spare drive—cleaning up your tracks when browsing the regular web or the deep web. Tails OS is essentially an incognito system that can be run from a USB drive, erasing all traces of your activity once the stick gets pulled out and switched off. If you want to dive into the world of the Tor browser and the deep web then that’s possible too. Another of the features that Tails OS brings to the table is built-in encryption, which means it’s going to be just about impossible for anyone else to get at your files, emails, and instant messages, even if you should leave your portable USB drive behind on the train. The era of the mixtape is pretty much over now, but you can rage against the dying of the light by sticking a few of your favorite tunes on a USB drive in MP3 form, then passing it over to someone special who you think might appreciate your taste in music. You could even add a handwritten track listing and liner notes to give the package that retro feel. A word of warning though: Even if you’ve got gigabytes upon gigabytes of room free on the USB stick, try and limit yourself to an album’s worth of music, otherwise your friend is going to be overwhelmed with all the new music they need to imbibe. Make sure you spend a while agonizing over the playing order too, as it’s crucial to the whole project.